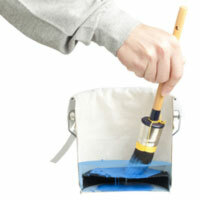 The increase in use of water based paints has brought more and more problems with brushes to light. With time, the bristles on a brush start standing out because left over paint dries up in the bristles, which is bad for the quality of the painting done with the brushes. In addition to this, the brush is too commonly washed under a tap. Because the brushes can no longer be cleaned properly, people throw away the brushes sooner than they normally would. Clean and Go makes this into a thing of the past. You save money and protect the environment. 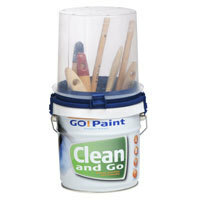 Clean and Go is suitable for all types of brushes. Thanks to the grid, the brushes stay in optimum condition. 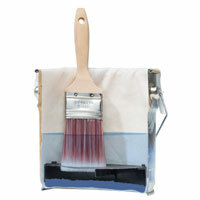 This contributes to a longer life and helps to ‘break in’ brushes. 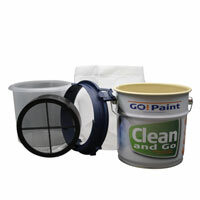 The ring Connect and Go enables you to put a lid on the kettle after cleaning your brushes. You can store your brushes perfectly for days . When storing, you can leave the brushes on the grid or click them in the brush clips.